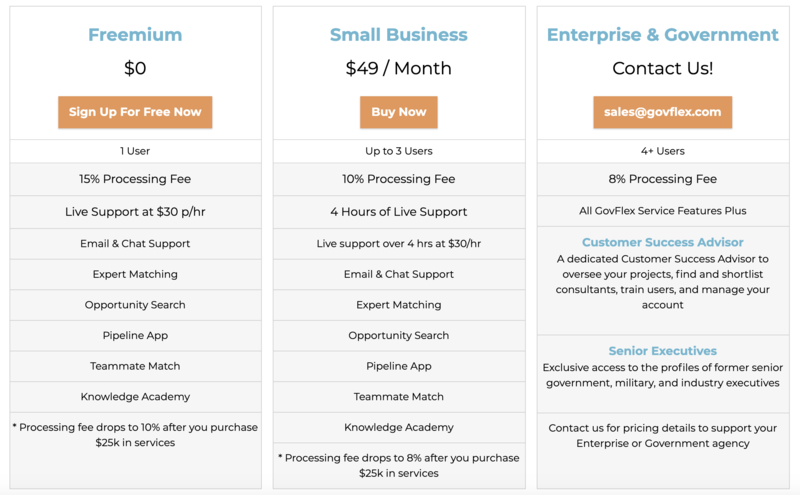 Pricing Plans, Features and Fees for access to the Government Freelance Exchange. How much does it cost to signup? Independent experts and Consultant Companies can signup and complete a profile in GovFlex for free in minutes. Once a profile is completed to 80%, it automatically becomes accessible to companies and agencies searching for freelancers to help with opportunities that range from subject-matter expertise, cost and pricing, proposals, to legal compliance and governance. The GovFlex processing fee covers operational costs including customer support and the secure payment processor, STRIPE. Many of our customers have praised the support received from our customer success and engagement managers and asked for support. Over a period of time, customers reported the customer support team increased confidence in their matches. How much is the GovFlex Processing Fee? A processing fee is added to the cost of each work engagement and is paid by GovFlex Customers. For example, if the service provider cost is $1000, GovFlex will add a 10% fee with certain plans and the cost is $1100 for the customer. The fee ranges from 8% to 15% based on the subscription. Small businesses are eligible for the 10% fee. Customers who purchase a subscription are billed monthly and can cancel at any time. Repeat customers who spend more than $25,000 in work engagements enjoy a a 2% discount on the fee. Repeat projects enable us to more efficiently provide support on complex projects, and we want to pass those cost savings back to our users. Customers who prefer not to subscribe can use GovFlex in accordance with our Terms of Service for free, but pay a 15% payment processing fee.